Tonight we will have more snow. 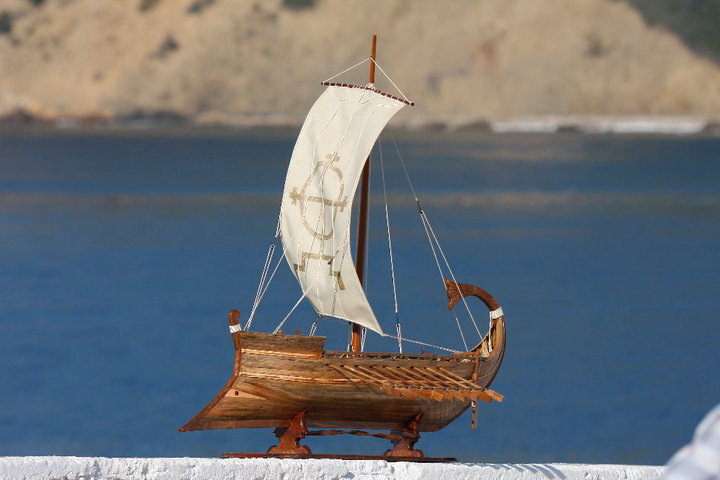 Alonissos will be hit too! Hopefully the machines will keep clear the roads towards the village because we don’t have that much food left. 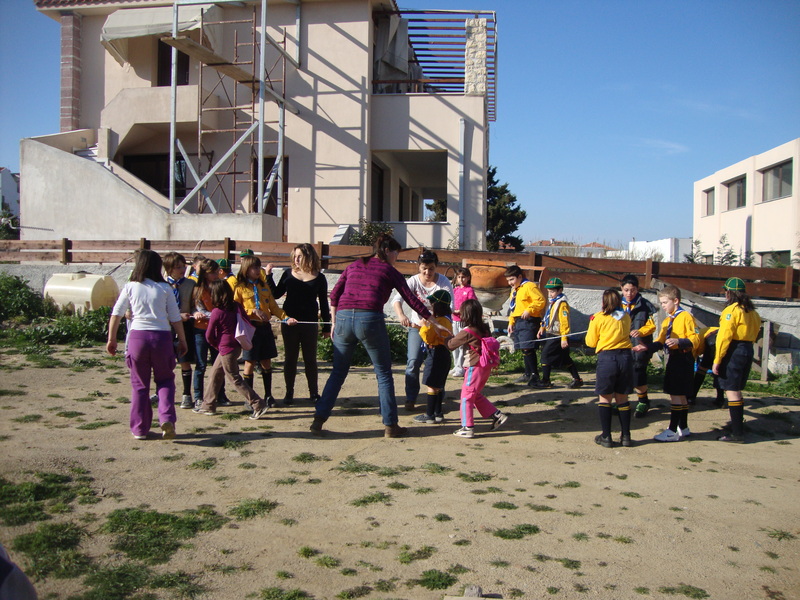 There are more families in Mourtero, Alikias, Panormos, Raches. They need to have their roads cleared too! 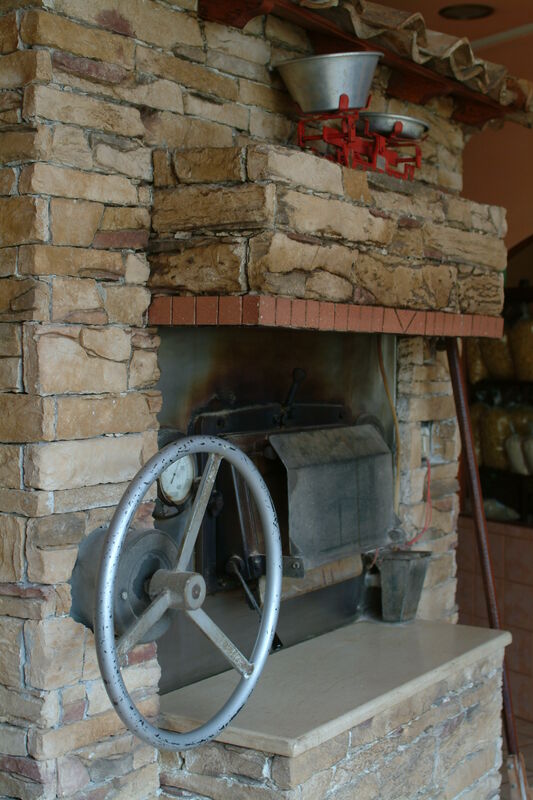 Here in the Agios Konstantinos/Raches area television is back again, we have electricity, central heating and water. A little higher up in Raches there is no water. The pipes are probably frozen. That is a big problem.There is also a lot of snow that is heaped up in front of windows and doors. What fun it will be when that snow will melt. We cannot complain though. Some refugees are sleeping in tents on Lesbos! Skopelosnews made a walk and took some black and white photographs of the white landscape around us. You cannot resist it! 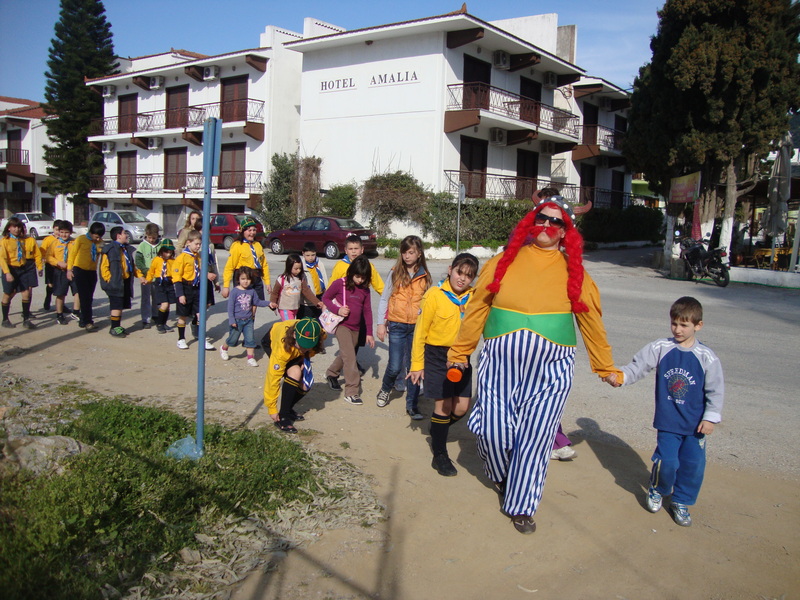 The Christmas bazaar (organized by the parents boards of the schools in Skopelos) was a great success this year. 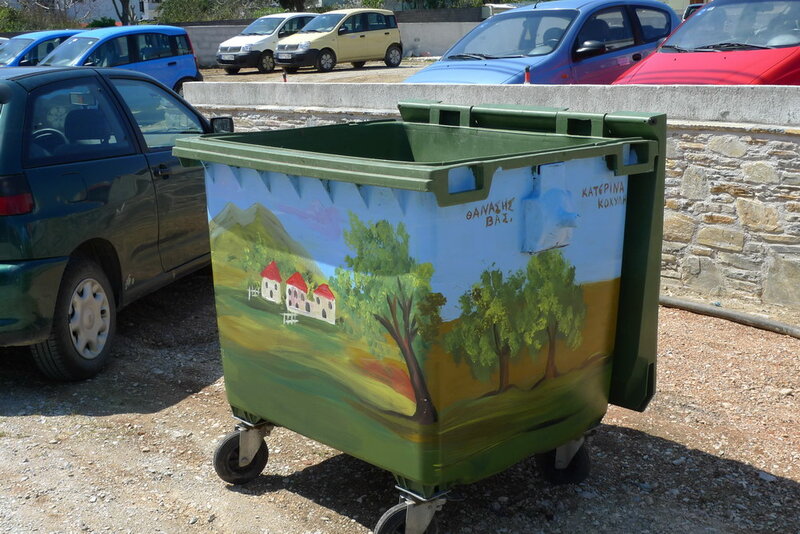 The municipality helped out with sound and materials and Maggi Klonaris and Athina Daki coordinated everything. Performances by children and singers were given and hot tea and chocolate were served. 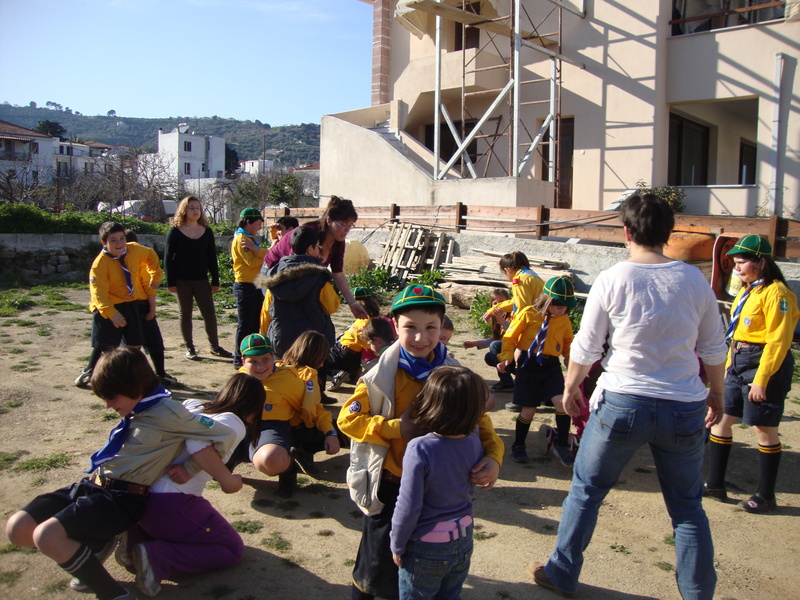 The scouts organized games. Many visitors were there for many hours to enjoy it all. Cakes and pies were made by the parents and handed out and hand-made christmas decorations and sweets were for sale. 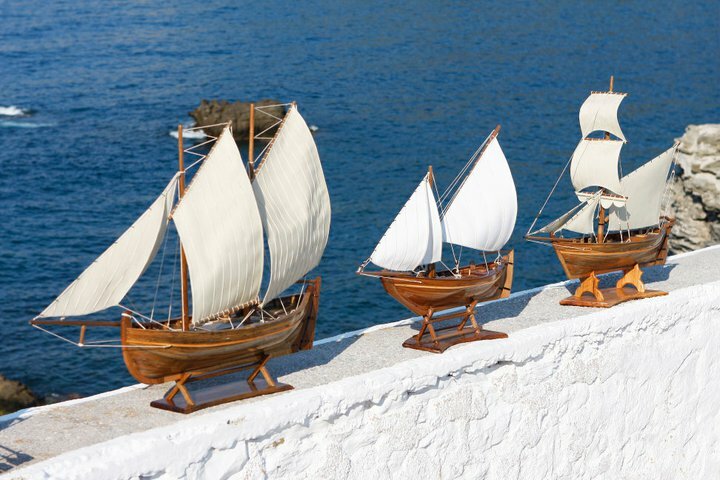 Hopefully this Christmas bazaar will become a steady feature on Skopelos every Christmas. On my (Daphne) way to work I met Mrs. A. She had several bags in her hands with plastic Tupperware boxes and I asked her if I could give her a lift. She told me to drive her down to the harbour. She put the boxes in the back seat. While driving I asked her what all those boxes and eggs were for and she said: “For the dead. I am going to relatives and friends and bring them the food.” She had made stuffed vine leaves because she likes to make them. No wonder the Greeks are so giving. Mrs. on her way to her relatives and friends. Yesterday my (Daphne) mother-in-law died after a long sick-bed. 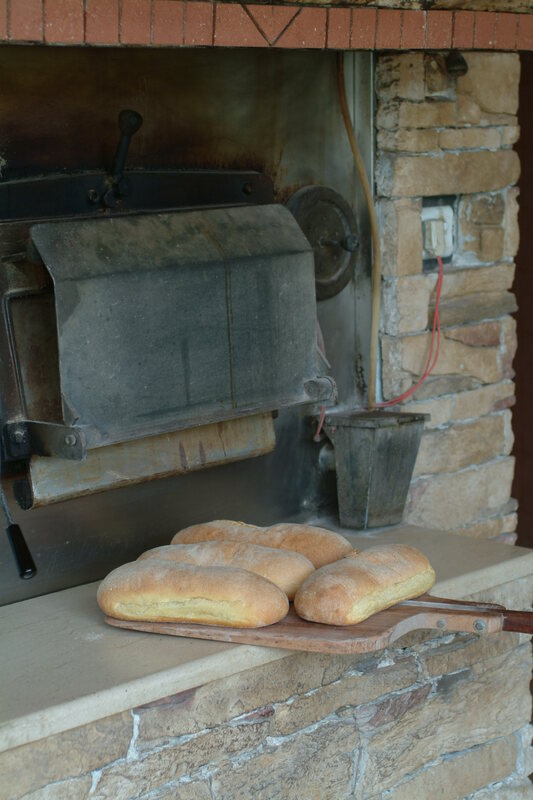 Margarita raised three children and eight grandchildren. When my kids were babies I would leave them with her with strict instructions about their diet and no matter how many hours I would be away she took care of them. There was never any complaint. She was always glad to see the children and would praise and admire them over and over again.The fact that her son married a foreign woman was never a problem. She accepted me from the start. She was the strongest pillar of our family. She did not finish the elementary school but managed to learn to sew very well and this work brought in the extra money they needed in the family. When she got sick she moved into her eldest daughter’s house and there we took care of her. We would watch her in shifts until the eldest daughter would come home from work. When needed we would hire extra help. The last few weeks we saw that the end was near and now that she is gone we are very sad but also feel thankful that she has been spared further suffering. 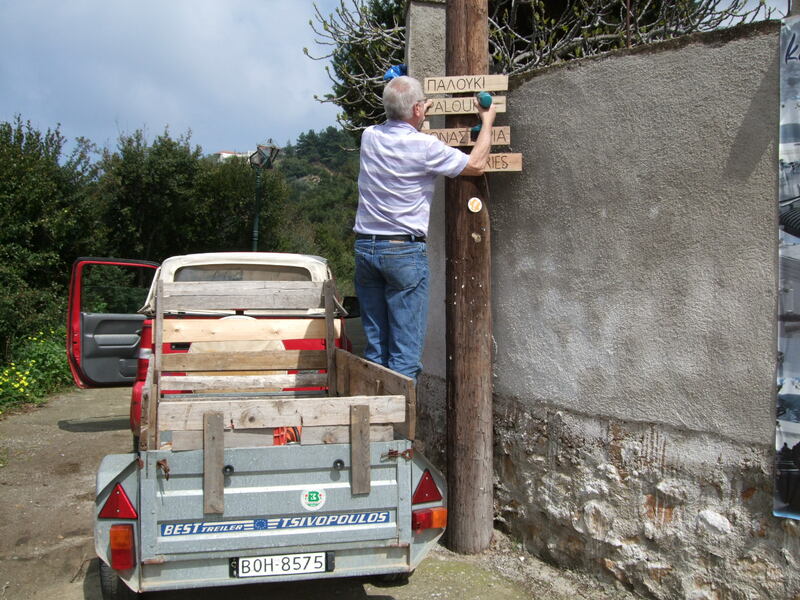 Here on Skopelos you have to order the coffin (one size) locally and because the man who has the coffins his truck broke down we had to get the coffin ourselves. A cousin with a truck went with us to pick it up. To start preparations for the funeral my mother in law was bathed and dressed and placed in the coffin. The coffin stands on two chairs in the living room. The whole night people have visited and said goodbye to her. The wake will last until we bury her this afternoon. 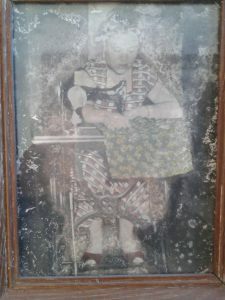 Margarita has her best clothes on which she selected by herself when she was still alive. During the night her face was covered. In the morning we removed the cover. A lighted candle stands next to her. When that is finished we place a new candle and light the new candle with the old. The leftover from the candle is placed in the coffin. Early this morning we went to a church and let the bells ring so people hear that somebody has died. For me this was a beautiful moment letting people know about our loss. 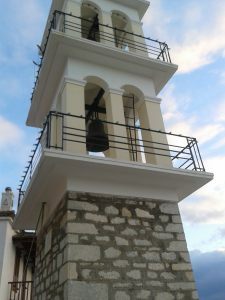 A neighbour volunteered to ring the bell later on again. The bells serve their purpose. Times before the telephone were as efficient to let people know what was happening. After we sorted the paperwork out we went to the grave yard to pick out a grave. As you probably know Greek people stay buried for about 3 years and get dug up again and some bones are placed in a small box which is placed in a church or the bones house on the cemetery. We had a choice of 4 graves. It will be difficult to move the coffin out of the house when the time comes so she will probably leave the house through a window. We will carry her to the church. She will go in through one door and will leave through the other door. A truck will pick her up somewhere in the village so we don’t have to carry her all the way to the cemetery. 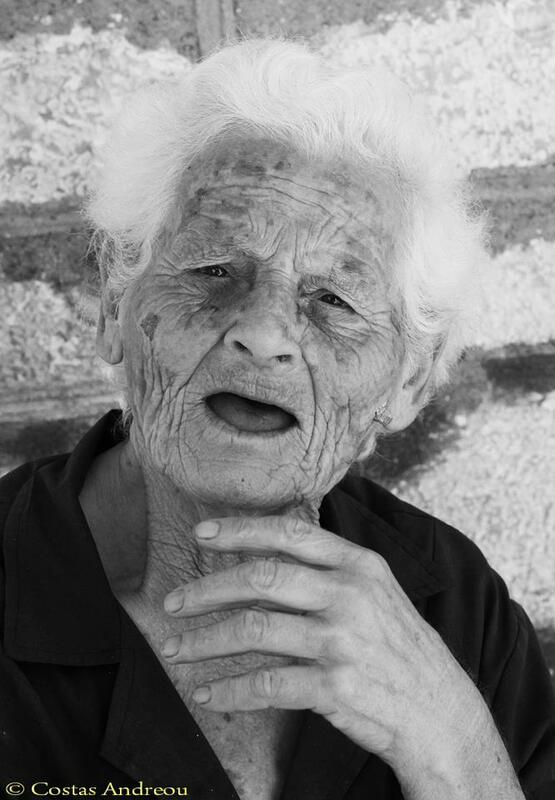 Margarita was a fantastic Greek mother, grandmother, sister and aunt. You can say a lot about Greek mothers, that they are overbearing, spoiling and pampering children and grandchildren but a more unselfish person like Margarita I have never met. The only thing she wanted was that you were ok and she did not like to be alone. She was the most happy with company. We hope she will be in great company where ever she is now. On Friday my husband and I (Daphne) were looking for tomatoes from Skopelos but unfortunately our local supplier was closed. My husband then said that he knew another local farmer and we went to see if he was at home. We found the father of the farmer on a beautiful piece of land with a small farmhouse in the Kampos area. It was very hot on Friday but the farmer, Mr. P, was dressed in jeans and soldier’s boots and a shirt. When we told him who we were he said, “Come in, I have stories to tell”. “I knew your father,” he said to my husband. He told us that, when they were young, they were hired to gather olives in baskets. My husband’s father was the fastest, all the time. 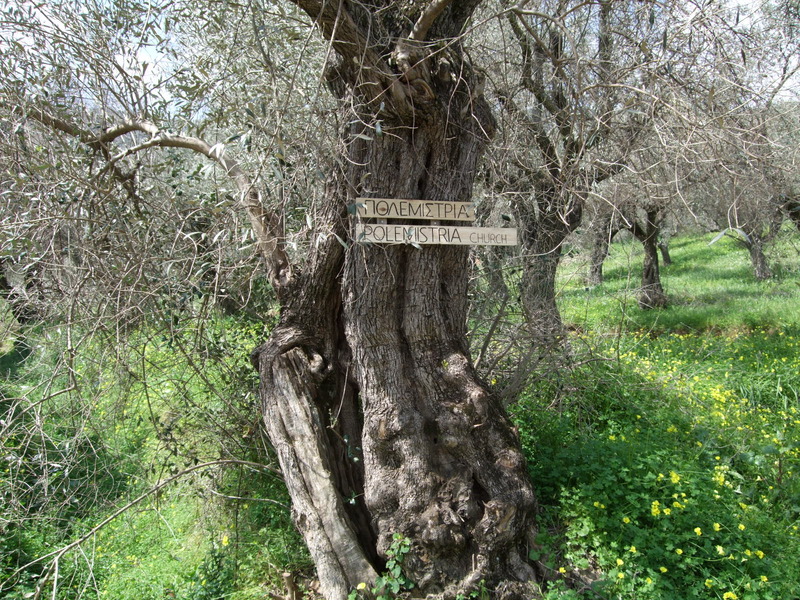 He also told us that crops were so good that women from Alonissos were hired to come and help here. 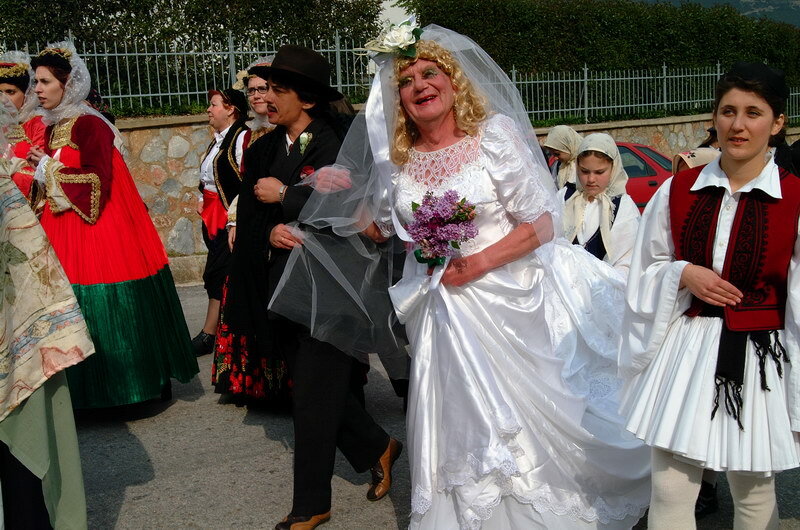 It maybe explains the fact that many women from Alonissos have married on Skopelos. 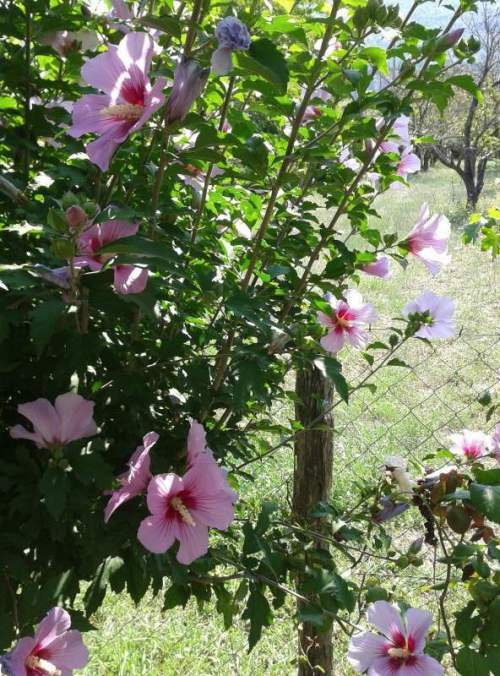 On the piece of land we visited, Mr. P and his son grow tomatoes, zucchini, plums, grapes, apples, cucumbers and nuts. They have been farmers for ages and nothing goes to waste. 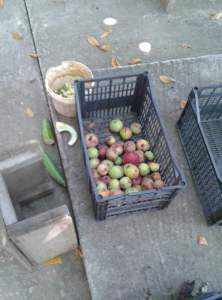 The apples that are not ripe but have fallen from the trees are used to feed the goats. They are cut up in small pieces and fed to them. 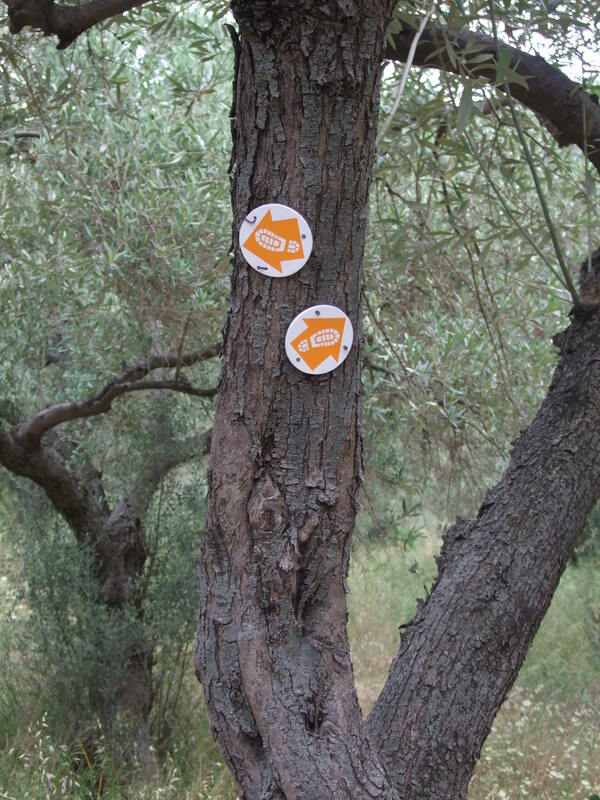 Mr. P. told us that his family once produced the greatest amount of plums and olive oil on the island. 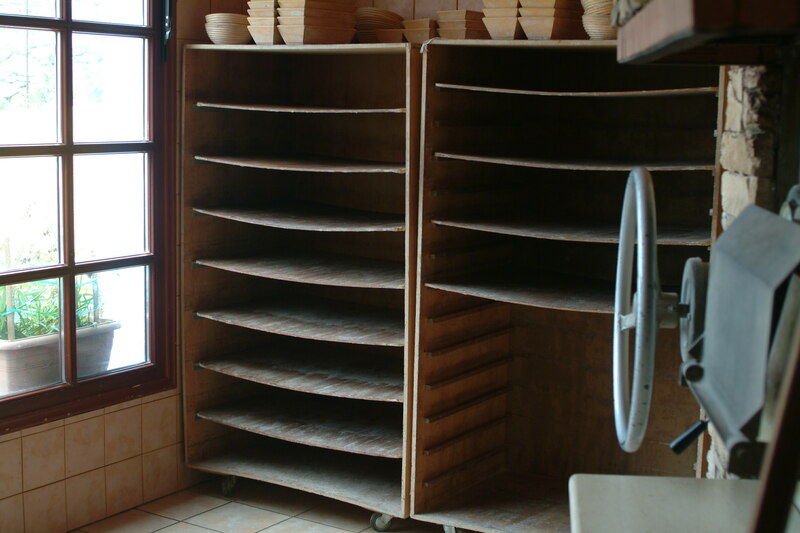 They had several plum ovens working. Mr. P goes to the harbour sometimes to drink a coffee but there is too much gossiping going on, he says, so he prefers to spend his time on his land. Mrs. P does not want to come to the farms anymore. She has had her share of planting, watering and harvesting. We picked out our own tomatoes. Mr. P. was angry with the weather. 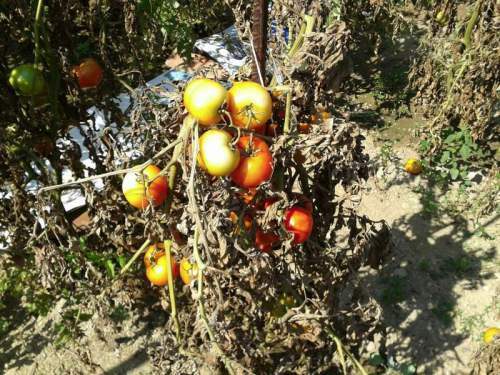 It is not good for the tomatoes, he said. They will be ruined in a couple of days. It’s too hot, he pointed out. Mr. P. also had some trachanas drying. He has all the time in the world. At the door I saw these lovely bushes. I asked mr. P how he grows them. “I don’t know” he said, ask Mrs. P.
Margarita is a widow and she has difficulty walking nowadays but and a great part of her day is spend in the churches that surround the Christos church. There are about 8 and she has the key for at least 3. Candles have to be lit, the floors have to be clean and in general the churches need to be ready for any event. I used to organize town walks and she was one of the few ladies I could count on to open a church for me and show it to my visitors. I never forget the evening when I arrived with a mixed group of Greeks and Spaniards and she told me it was too late to show the church. Many churches, mainly the smaller ones, don’t have electricity. I looked at her and begged her to open one. She took a look at the group and me and went to the nearest church. We waited outside and she came back with a handful of small lighted candles, everybody took one and in we went! One of the Greeks was the son of a priest and he started singing quietly when we were all inside. Margarita followed his song and after it was finished we all thanked her for her kindness. An unforgettable memory because of Kyria Margarita. I (Daphne) have photographed Vasilis a couple of years ago with his sister and cousin and printed out their photos and gave the prints to them. 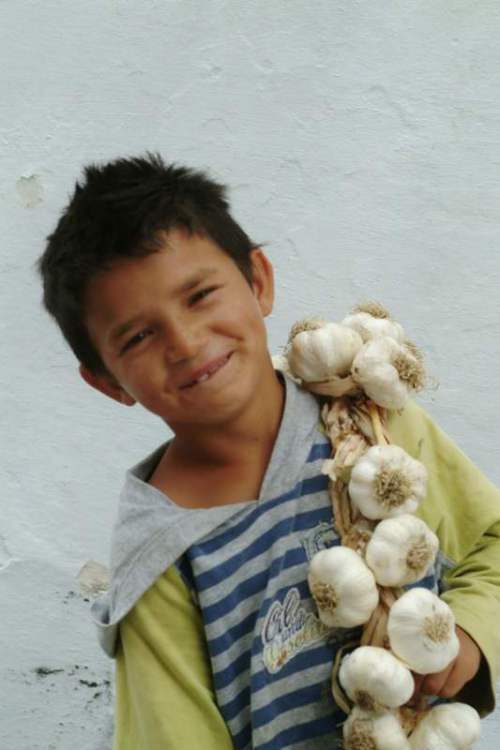 That has made a real impression and every now and then he and other family members come in the office and try to sell me what they have for sale (garlic, potatoes, onions, apples, melons) and they will also ask if I can take their photograph again. I usually say I am too busy (which is not always true I must admit) but not today. I took my camera and we went outside. 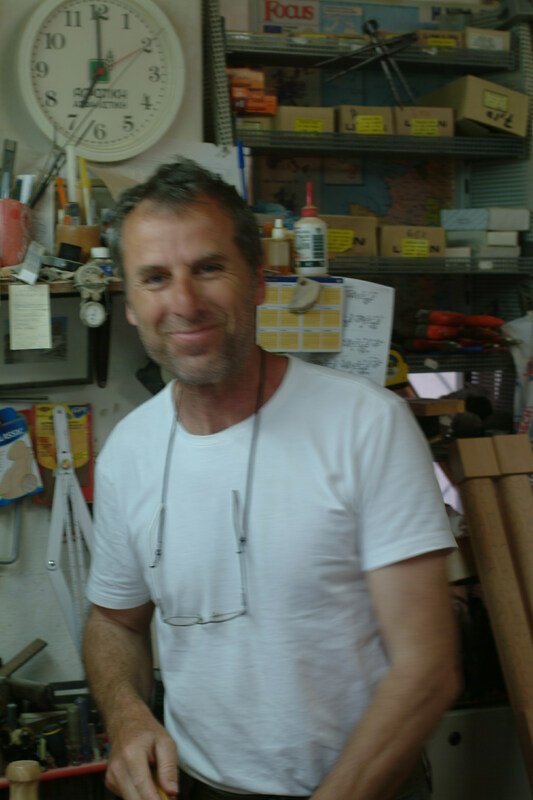 I like the fact that Vasilis comes into the office with great confidence and he is not too shy to ask for a photograph. 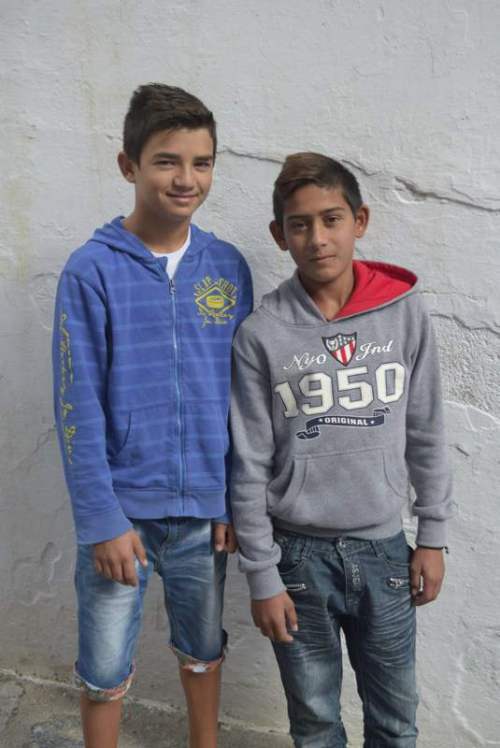 Here he is with his cousin Adonis. I took their picture and printed two copies. They went off quite happy … and came back 30 minutes later with a bag of onions in their hand and asked if I could photograph them again and if I wanted to buy some onions! 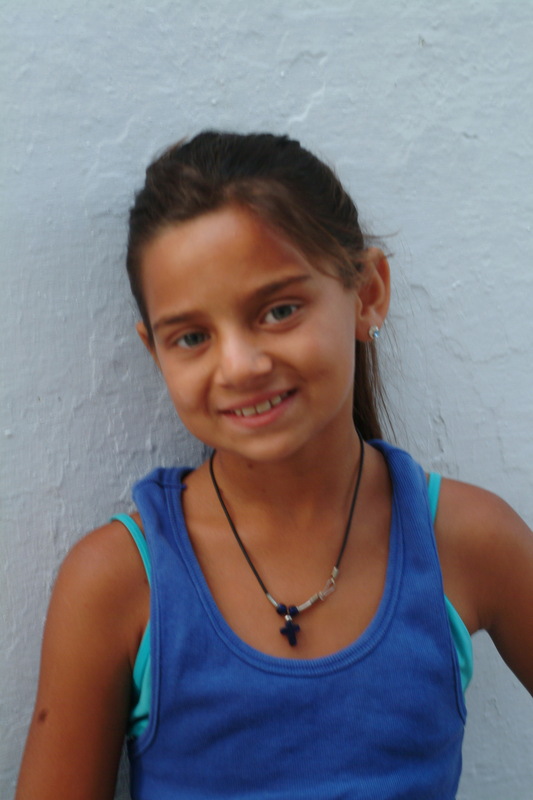 The children live part-time on Skopelos and in Volos. 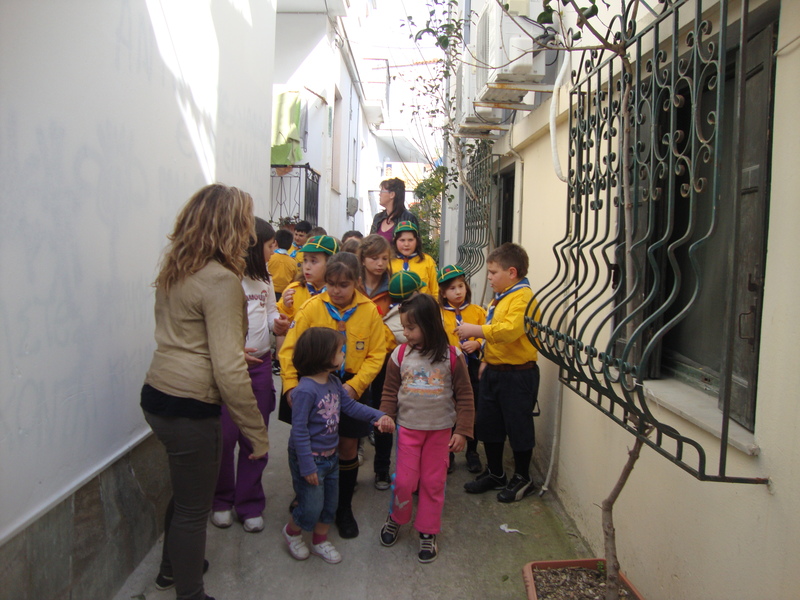 They say they go to school in the winter in Volos. 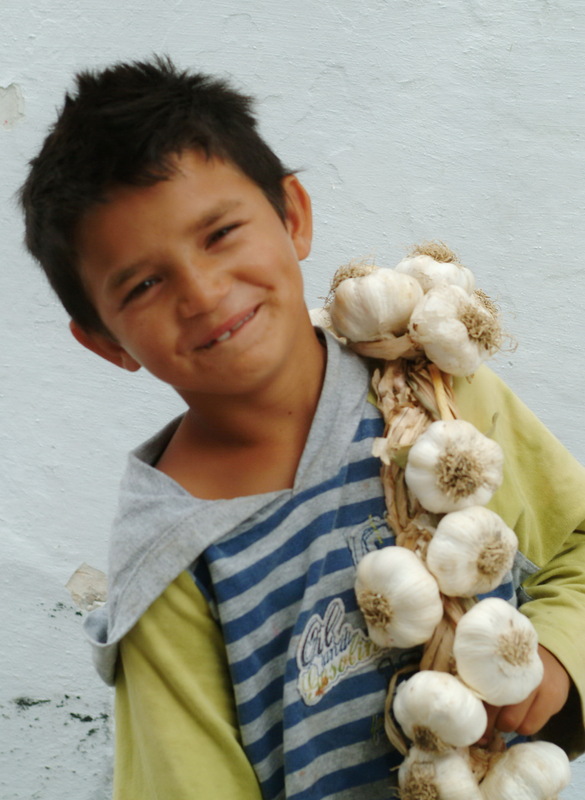 In the summer they sell the fruits and vegetables their parents have. This is the new guy. 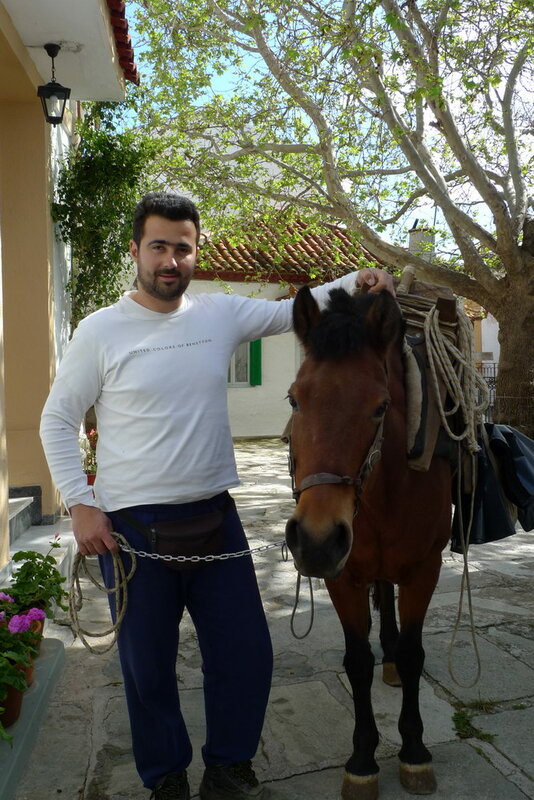 Rigas and his horse Foula. 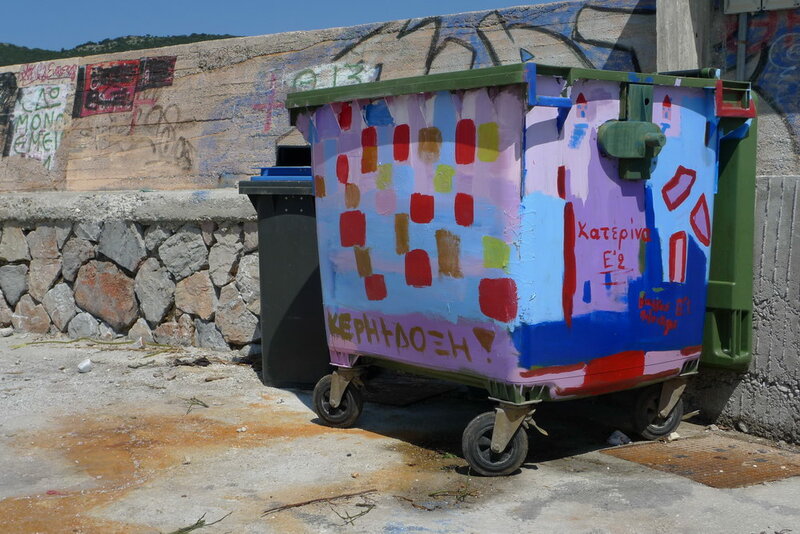 They collect the garbage in the top of Skopelos town. Like they have done it for years. Foula got used to the extra load immediately. She is an easy horse Rigas told us. 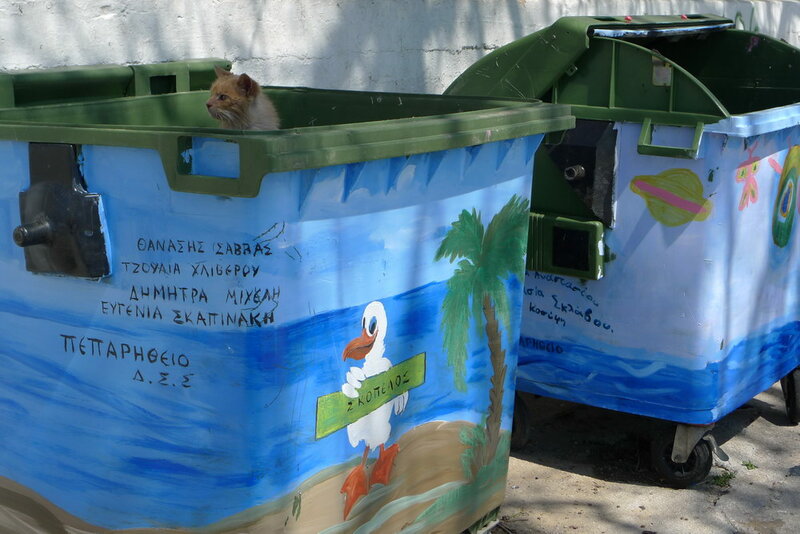 This is Danos, he lives on Skopelos. 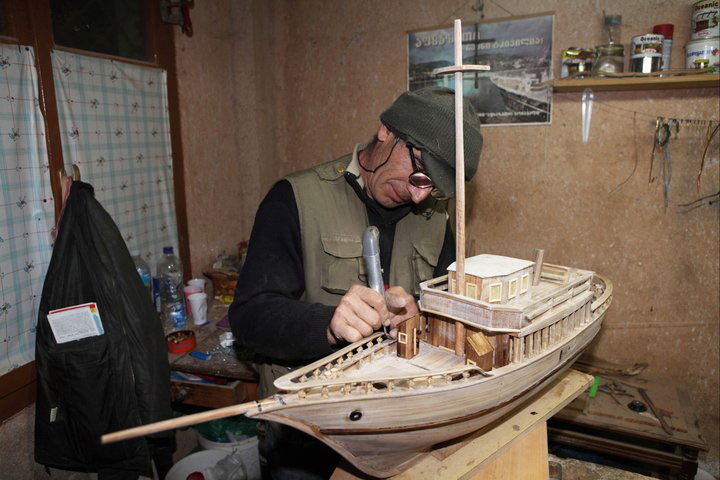 In his spare time he build boats, big boats and small boats from scratch. 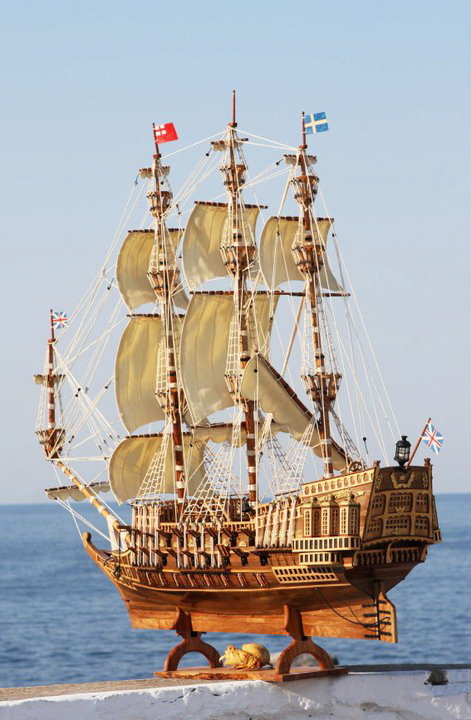 Small pieces of wood, the original plans and he is off. He also restores icons. 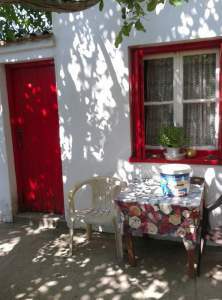 Has a small work place in the top of the village of Skopelos. If you want to see his workplace please ask for directions via the contact us page. Write meeting Danos as a reference. This is Babis. 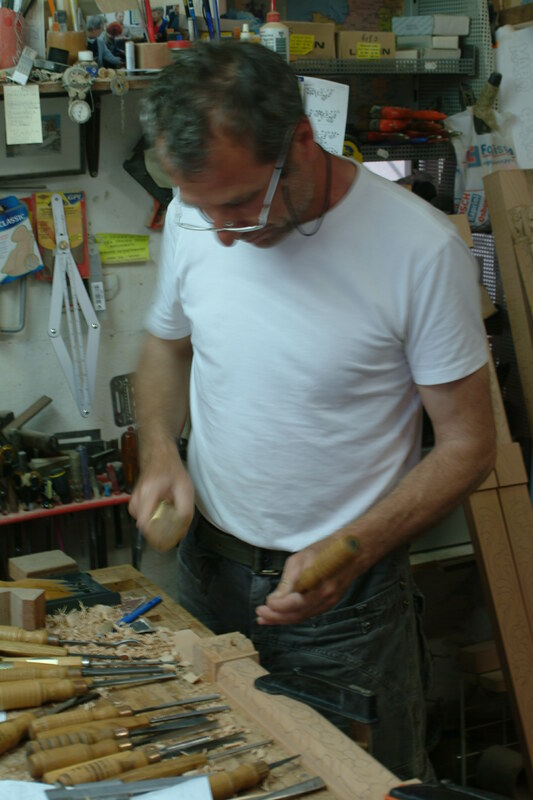 He is a carpenter. 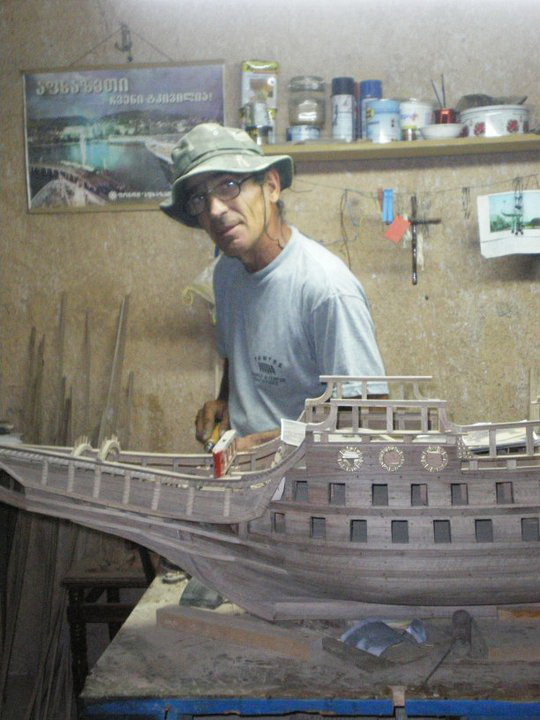 He lives on Skopelos.The last 22 years he has been working with wood. 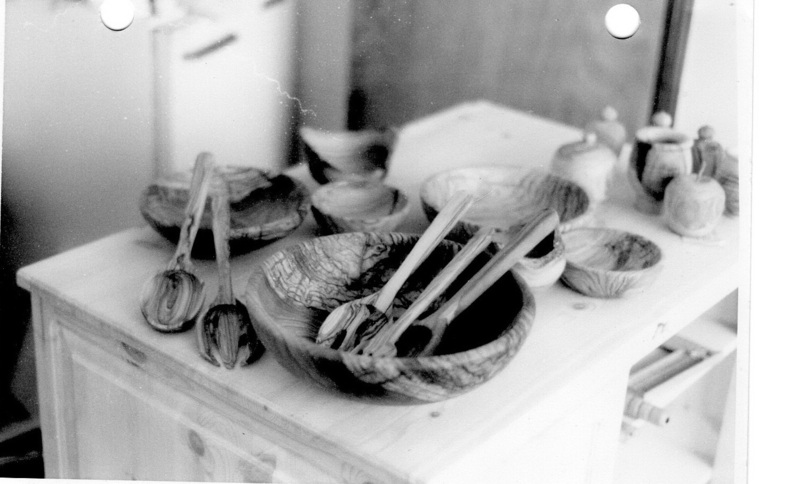 He started with plates, spoons etc. and later furniture. 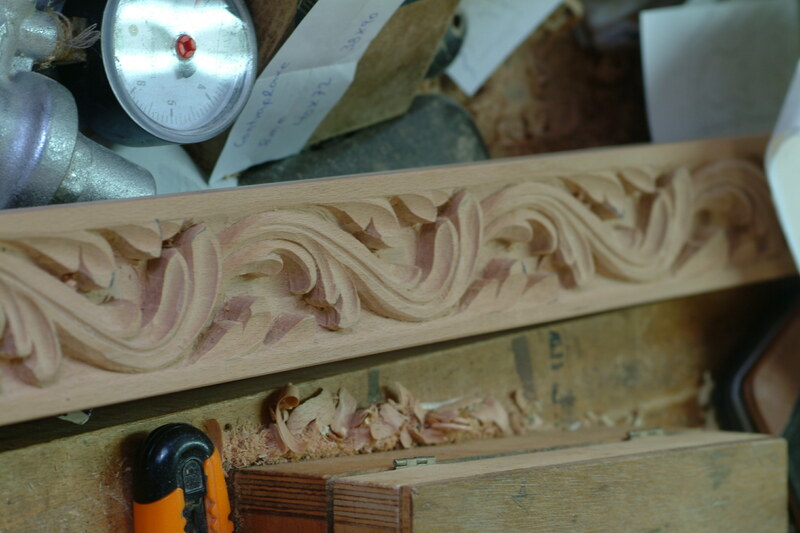 Now he is considered “the specialist for wood carving” whether it is for a furniture piece or an icon wall in a church. His small work shop is in the middle of the village between Maggi’s butcher shop and supermarket Melissa. Yes the rumour is true. Peter cave is going back to England. We will be very sorry to see him leave. I (Daphne) remember Peter always with a bucket with catfood. Winter, summer, cold, warm weather. Peter was always there for the cats, in the old harbor. Kind, helpful and attentive. At the NASA meeting he was there with his own stories. Used to be a boy scout and wanted to help out with activities organized by the local scouts here! In the SCAN booth answering questions…. The small story below is from friends: We are not sure how long Peter’s been here; about 15 or 16 years. He’s an electronics engineer, was a Commander in the British Navy and was in charge of aeroplanes on Ark Royal (flagship Destroyer) – this including getting them up on deck and down below again. He also worked with the Americans at Cape Canaveral and has been on the Polaris submarine. When he retired he was a tour guide on open-topped buses in the historic town of Bath, UK. He produced CD talking books for the blind and received the MBE for this – a prestigious award – for services to the community given by the Queen! 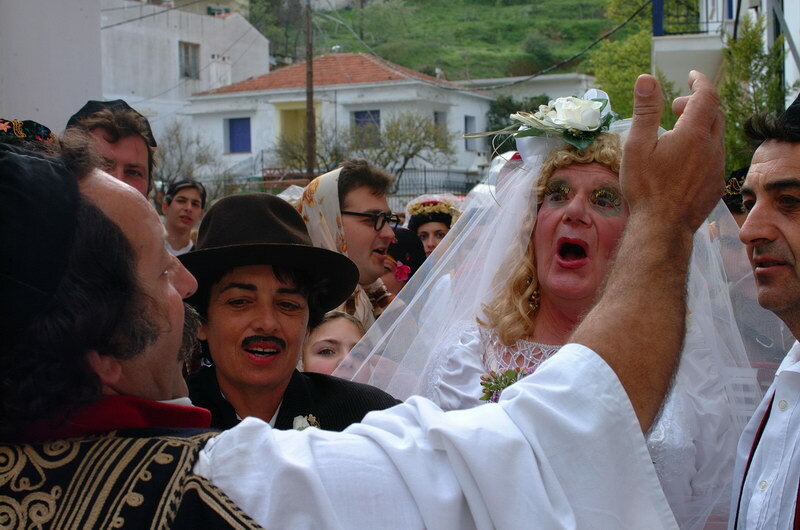 During his time here, he has worked as a rep for Laskarina which included entertaining guests at Del Sol at the ‘Greek Evening’ with his limericks and humorous poems. He’s renowned for his tale of ‘Albert and the Lion’! He has helped many people with their electrical problems. 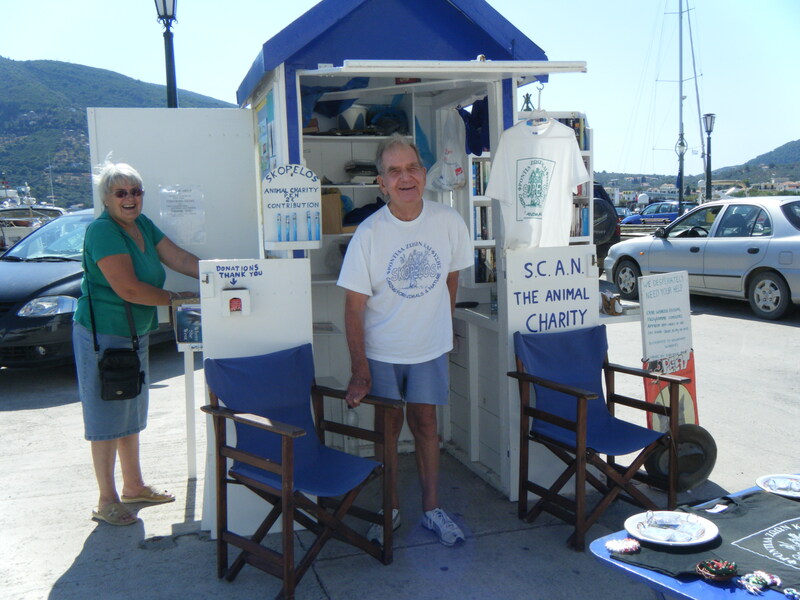 He has been involved with SCAN since he’s been on Skopelos. He’s been a member of the English singing group. 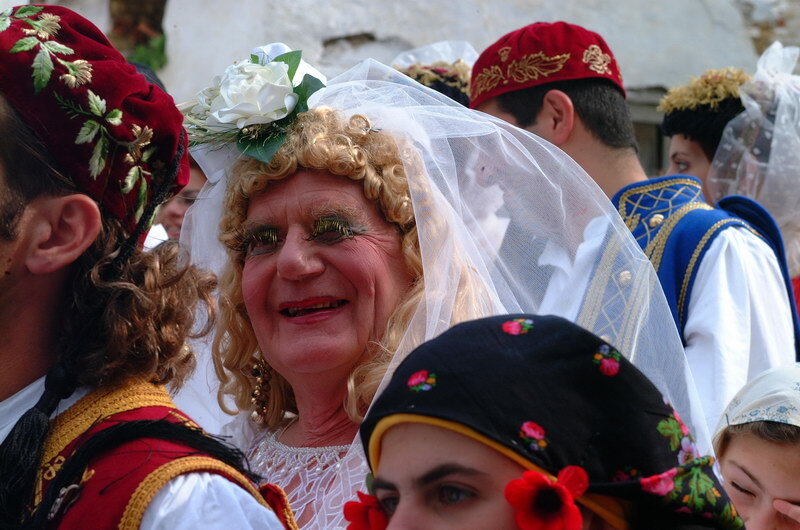 Some will also know his ‘alter ego’ Petronella and in this form he was the bride at Carnival for a number of years. 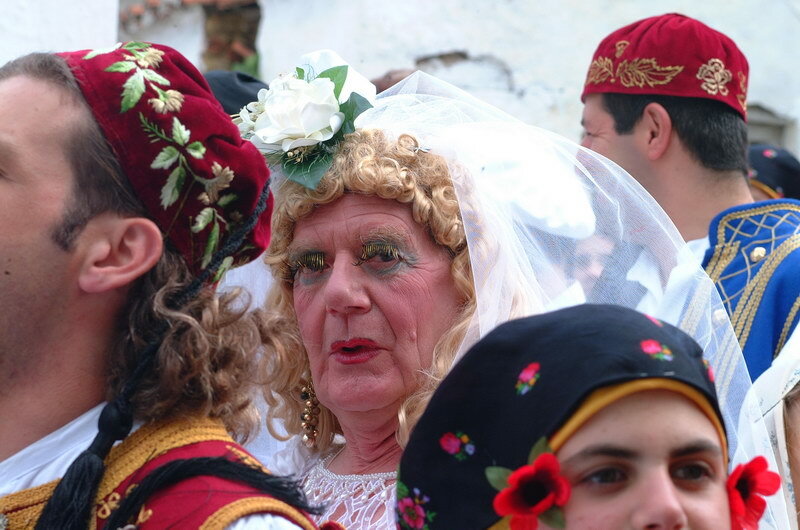 The last Sunday of carnival on Skopelos a big group of people dress up, many in traditional Skopelitan clothes and join in a wedding procession. They sing, dance and go through the town and stop at every square to show off. Locals from the neighborhood present them with drinks and rice pudding. 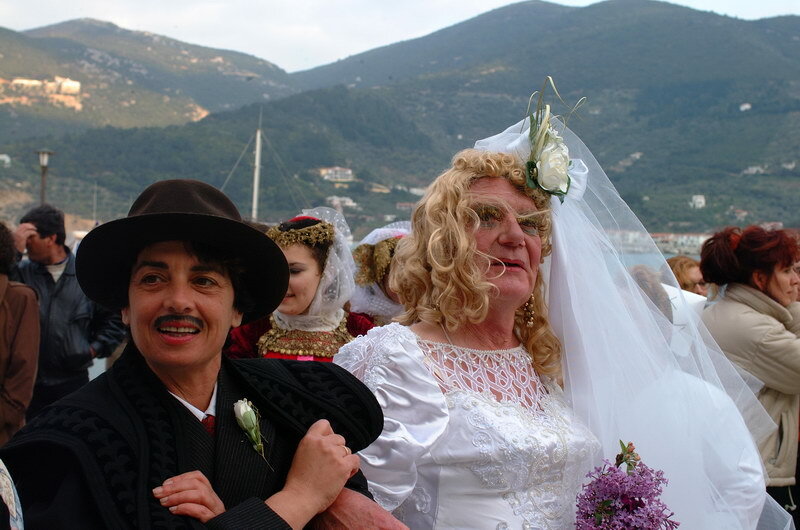 Usually the bride is a man and the groom a woman. It is called Oi kales . These pictures of Peter have never been published. We would like to show them now !! 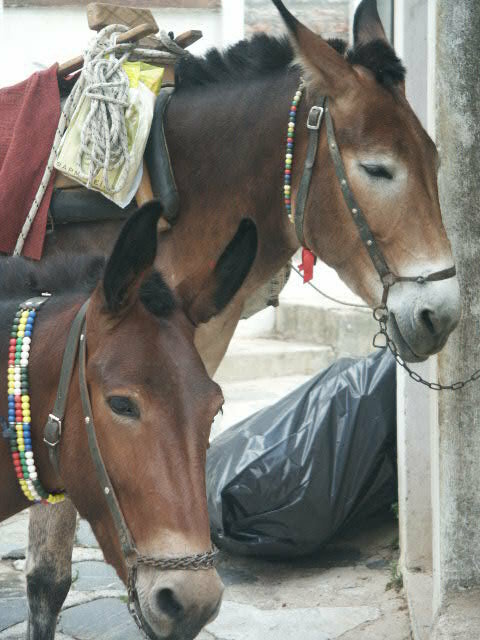 These horses/mules worked for many years in the top of Skopelos village and collected the rubbish there. The rubbish couldn’t be collected by car because of the steps and because the streets are not wide enough. We don’t see the horses and their boss anymore and that is maybe because the job went to another horse and his boss. That is how it goes at the moment. Many people working for the council cannot be hired permanently and get a contract for 8 months. After that they are out of work for a couple of months and then they can be hired again. When they keep working for the council, it is obligated to give them a permanent contract and that is impossible at the moment. 5 people have to go with retirement and 1 person can be hired. Aristea, Vasilis and 1 day later Athanasia. Because I have photographed their father/uncle, they asked if I could photograph them too. Aristea and Vasilis and 1 day later Athanasia. Amongst other things they sell garlic, a mellon and a frying pan. An afternoon with the younger scouts is not an easy task. The photographs, we think, speak for themselves……. They will paint them all if they don’t run out of paint ! 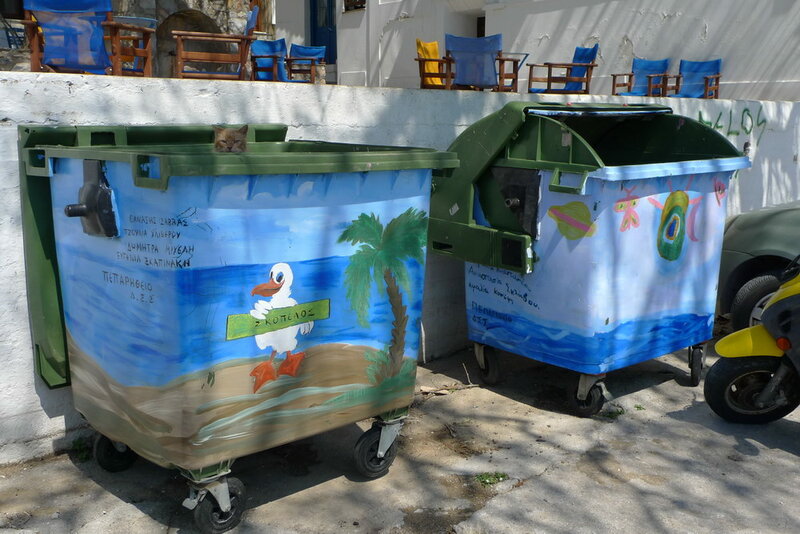 Thanks to the head mistress of the elementary school and the art teacher, these colorful bins colour our days since last week. 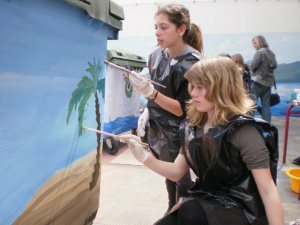 We asked her if they will continue with the project and she said yes after Easter but they need new paint (for plastic) and brushes to continue. 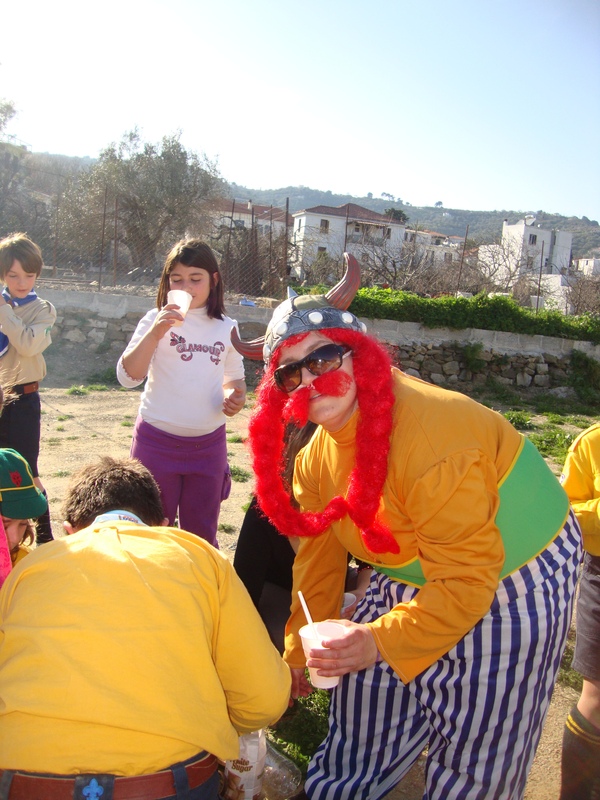 Anybody who has leftovers or is willing to buy some paint (the basic colors) can leave it at the elementary school in the first building where the head mistress office is (Maggi Andreou). 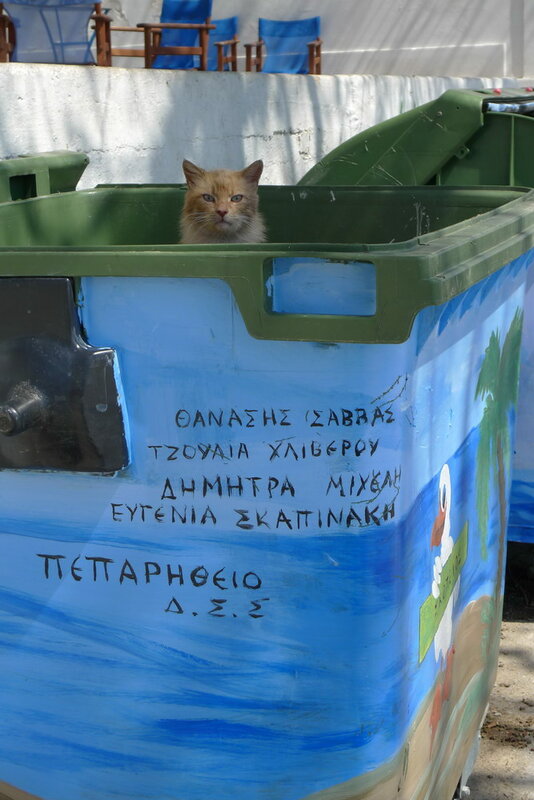 The cat in the bin is already used to its new home. 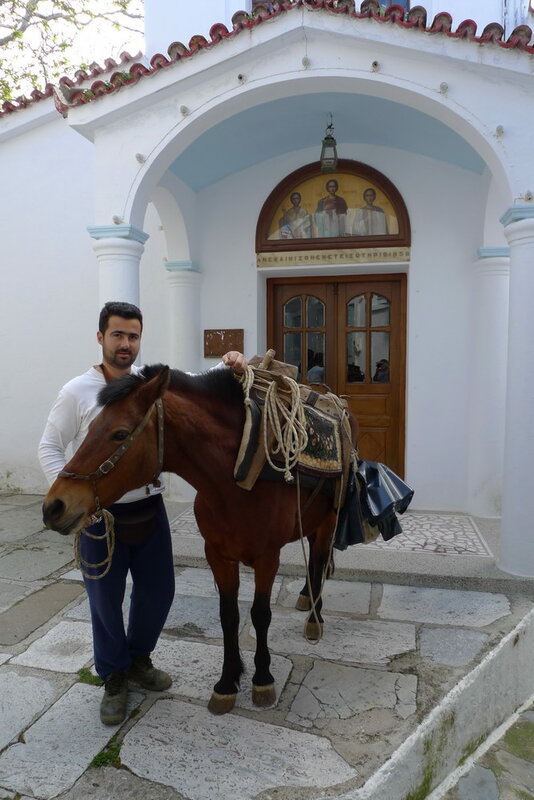 I would like to contact anyone on Skopelos who is working with animal welfare for donkeys (and/or horses). Please backchannel me…………………….